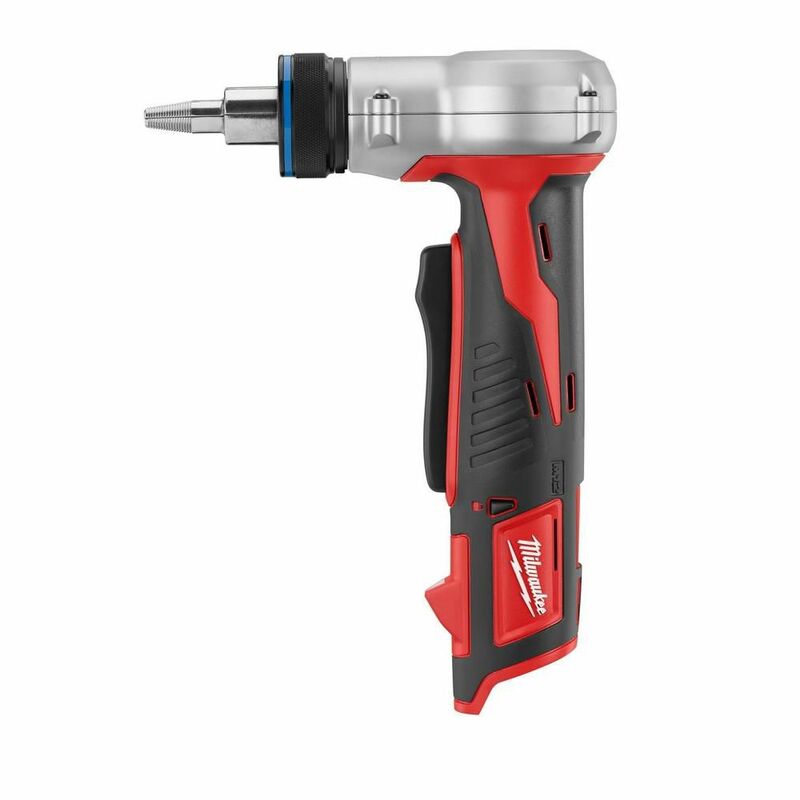 The M12 Cordless LITHIUM-ION ProPEX Expansion Tool by Milwaukee features an auto-rotating head for convenient one-handed operation. Its compact right angle design makes installing tubing in tight locations fast and easy, and the quick cam mechanism delivers precise, continuous expansion for 3/8-inch to 1-inch ProPEX connections. Designed specifically for Upon or ProPEX, the M12 ProPEX Expansion Tool is built to make effortless installations faster than other tools available. Optimized for high speed fastening, the Milwaukee M12 1/4 inch Impact Driver delivers unmatched fastening performance in a lightweight, tool belt portable design. A high performance motor delivers 0-2,500 RPM for increased application speed. Additionally, an on-board battery fuel gauge displays remaining run time. The XXL black heated hoodie is powered by the M12 REDLITHIUM battery. Each heated hoodie uses carbon fiber heating elements to create and distribute heat to the chest and back. A single touch LED controller heats up the battery heated hoodie to three heat settings. This MILWAUKEE heated hoodie kit has a new Quick-Heat funtion that allows you to feel heat three times faster than our previous hoodies and market competitors. The hooded sweatshirts are built with a durable cotton/polyester exterior and waffle weave thermal lining. This provides a versatile three-season solution to keep heat trapped in without bulky additional layers. M12 12V Lithium-Ion Cordless ProPEX Expansion Tool (Tool-Only) The M12 Cordless LITHIUM-ION ProPEX Expansion Tool by Milwaukee features an auto-rotating head for convenient one-handed operation. Its compact right angle design makes installing tubing in tight locations fast and easy, and the quick cam mechanism delivers precise, continuous expansion for 3/8-inch to 1-inch ProPEX connections. Designed specifically for Upon or ProPEX, the M12 ProPEX Expansion Tool is built to make effortless installations faster than other tools available. M12 12V Lithium-Ion Cordless ProPEX Expansion Tool (Tool-Only) is rated 4.6 out of 5 by 35. Rated 5 out of 5 by TFP&H from owner Have been using this tool for about 3 years now. I would recommend it to anyone using pex with expansion connections. The tool is lightweight and faster than the uponor tool I had. The fellow that posted the one star review should check to make sure the expansion head is on all the way. I had this problem with the three quarter head when I first got the tool. I have many Milwaukee tools as I am a plumbing contractor and I stand by this companies tools. Rated 5 out of 5 by handyman from this tools is smooth, works great. quick to change different size attachments, beat manual tool. ... this tools is smooth, works great. quick to change different size attachments, beat manual tool. Borrowed a friends for a small job, had to have one. must tool even for a non-plumber handy man. Kit not cheap, but worth it, must have. Rated 5 out of 5 by Mike from This is a well made product. Fair price. ... This is a well made product. Fair price. Rated 2 out of 5 by Jeffery from After reading reviews Milwaukee stated that a 1/2” head would... After reading reviews Milwaukee stated that a 1/2” head would be included with product. I received the box which also stated there was supposed to be a 1/2” head included and when I opened it no head. I have seen other reviews after I purchased saying they had the same problem. Tool works otherwise. Rated 5 out of 5 by Thinh from Works as I expected! ... Works as I expected! Hi, What is included with this tool? Does the tool M12 come with expansion ends for 1/2, 3/4&quot;, and 1&quot; PEX pipes?